I have a database with three tables with primary and foreign key association . I am using Web API and Entity Framework to auto generate methods. I have been successful doing that. But I want to insert into a table with foreign key separately. Currently, I am able to get a JSON object for the main table which has primary key and navigation properties to the table with a foreign key. I have created the web api using auto generate read write action methods like . I am able to access the json object for floors database and accordingly for Meter and Router . 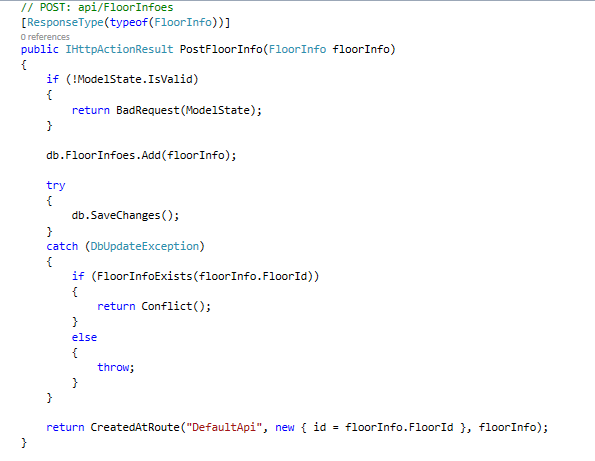 So , I have a post method "/api/floorinfoes" with POST . 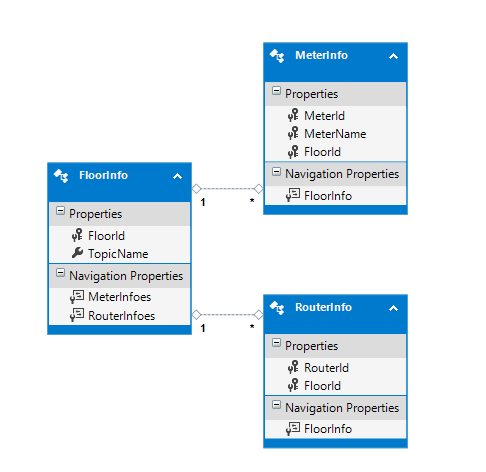 But , what to do , if i want to insert separately into RouterInfo table and MeterInfo table .Eg: If i want to insert one row in MeterInfoes table, then how to proceed with that . If you want to insert one row in MeterInfoes Table. I think the answer is to auto generate API Controllers for both MeterInfo and RouterInfo. Not the answer you're looking for? Browse other questions tagged post asp.net-web-api entity-framework-6 asp.net-web-api2 asp.net-web-api-routing or ask your own question.